Sagwa the Chinese Siamese Cat, written by Amy Tan (author of the Joy Luck Club) with illustrations by Gretchen Schields, is a delightful children's book that led to a TV series of the same name. Inspired by Amy Tan's own cat, Sagwa, who lived to the age of 21 and is referred to by the author herself as her 'late and dearly beloved kitty', the book starts in the present, with Siamese cat Ming Miao telling her kittens about their ancestry. 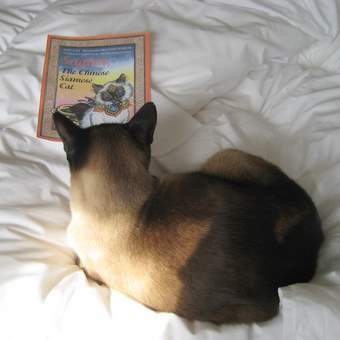 Bandit reading Sagwa the Chinese Siamese Cat! … and Sagwa was a pearl-white kitten, living in the court of an unkind ruler, the Foolish Magistrate, who has a habit of making up all sorts of restrictive rules for his oppressed subjects. Sagwa's parents, Baba Miao and Mama Miao are calligraphers, who must use their tails as brushes to write down the Foolish Magistrate's laws. Sagwa (whose name means 'silly melon head') is just as mischievous as any modern-day Siamese kitten; she is accident-prone and always getting into trouble. Accidentally overhearing this, Sagwa leaps onto the Foolish Magistrate's desk, and into a pot of ink. In trying to get the ink off her face, she blots the Chinese symbol for 'not', turning the rule into 'people MUST sing until sundown'. Seeing what she's done, she continues to alter the decree by using the ink on her paws to erase the names of the people who are going to be fined for breaking this law. Unfortunately, she then discovers that the ink in the pot is permanent, and she has dyed her paws, face and tail black. Horror! The Magistrate will now know that it was Sagwa who changed the rule. Will he throw Sagwa and her family out onto the street? How the story ends … well, you'll need to read the book to find out! But it does have a happy ending, and needless to say, Sagwa and future generations all keep the black face, paws and tail for which Siamese cats have become famous. Sagwa the Chinese Siamese Cat was the inspiration for an Emmy award-winning animated TV series for PBS Kids (the series also won the Parents' Choice, Best Television Program for Children Award) featuring all the characters from the book.